The successful Roman painter Pietro Antonio de’ Pietri was a celebrated draftsman and his bravura is on full display in this double-sided sheet, which employs two very distinct manners. On the recto, his handling of the pen and brush is expressive and use of wash is bold, employed to represent the energy of the fluttering choir of angels and miraculous flickering light around the Virgin and Child. On the verso, in contrast, de’ Pietri represents the figures with exacting pen and ink lines and crosshatching to create the illusion of three-dimensions on the flat sheet of paper. 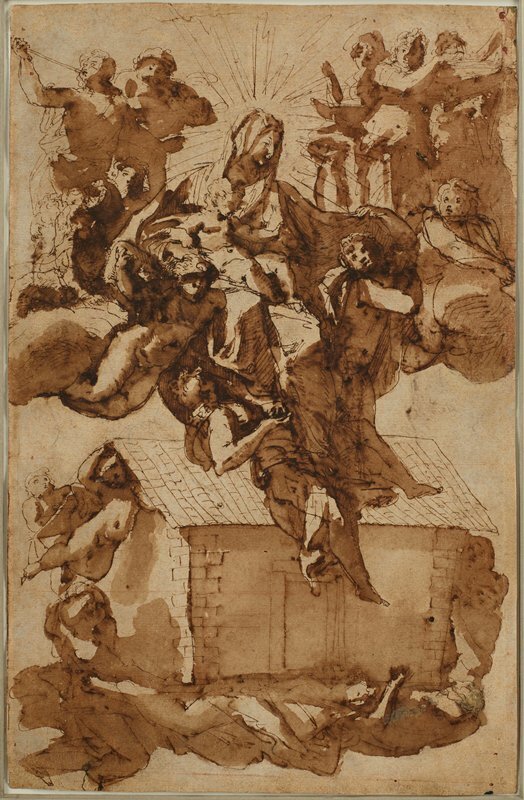 This is a superb example of the work of a skilled 18th-century Italian draftsman. This is a strategic area of the collection to cultivate as the market continues to under value the extraordinary quality of 18th-century Italian art.